Concerned about stretch marks? Babytalk exhibitor Lisa Heeney has some tips and a Beautiful Belly Bar to give away! Just comment below or on the corresponding facebook post to be in with a chance to win! Pregnancy is a time of change, both physically and mentally. Some women breeze through the 42 weeks whilst others have a more challenging time with discomforts such as morning sickness, sleeplessness, heart-burn or excessive swelling (Honestly, it’s all forgotten in the end!). A common result of a rapidly changing body size and shape is stretch marks which, unfortunately, can be accompanied by tight, itchy, inflamed skin as it stretches to embrace your growing baby bump. Stretch marks can happen when the rate of growth of your skin has difficulty in keeping up with the rate of growth of your body underneath. Changes in skin physiology mean that structural fibres in the middle layer of your skin are stretched and often broken, causing the appearance of darker pigmented lines around your belly, breasts and thighs. Not everyone gets stretch marks, but there seems to be some factors that might make getting stretch marks more likely: stress, dehydration, rapid weight gain, and unfortunately, genetics (not much we can do about that one girls!). It is not realistic to say that if you do x, y or z you will definitely not get stretch marks, however, staying hydrated, incorporating healthy oils like olive oil and coconut oil into your diet, and keeping your skin well nourished to improve its elasticity will help make your growing body more comfortable. From working regularly with pregnant women, in my opinion stress is also a big factor in how a woman’s body reacts to her pregnancy, so staying relaxed, both mentally and physically and allowing your body to work properly, is very important too. Getting reflexology, going for a massage, doing yoga or going for some acupuncture are all wonderful ways of helping to stay relaxed, and physically and emotionally balanced when pregnant. Another important thing you can do for yourself is to care for your skin and keep it properly nourished and hydrated as your pregnancy progresses. Your body diverts many of the nutrients you take in via your food to your baby, so it’s important to give your skin some extra love in the form of proper moisturisation and TLC. Whilst no cream, lotion or potion can or should say that it will 100% prevent stretch marks, improved elasticity of the skin may diminish their appearance somewhat and improve how your skin feels. Properly moisturised skin will not feel as tight or as uncomfortable, and certain beneficial ingredients may also help with inflammation and itchiness. Taking the time to look after your body and pay it some attention is very rewarding in itself. Spending a few minutes in the morning, after your shower, or before you head to bed in the evening time, massaging your bump will help you relax. It’s nice to use some gentle sweeping strokes moving one hand up from the bottom of your bump to the top, whilst bringing your other hand down from the top to the bottom, in a relaxed circle shape. It feels lovely to use your knuckles to massage your legs and thighs upwards towards your bum as it helps to relieve daily tension build-up and improve circulation. Improving blood flow to your womb and pelvis is important through massage and gentle exercise because it allows a good oxygen supply to baby. Just as it’s important to be prudent about what you put into your body when you’re pregnant, it’s equally important to pay attention to what you’re putting ON your pregnant body, as a percentage of what you put on your skin will pass to your blood stream and can cross the placental barrier. It’s wise to avoid harsh chemicals with artificial fragrances and colours, or that are petroleum based as these have been linked amongst other things, to causing hormonal imbalances, both for you and your developing baby. Skin can also be in a state of heightened sensitivity when you’re pregnant, so is much more likely to react badly to irritants and synthetic compounds. Beeswax (locally sourced from Co. Louth), Cocoa Butter, Shea Butter, Coconut Oil, Rosehip Oil, Calendula Oil and beautiful essential oils – some of my favourites include Neroli, Frankincense, and Chamomile. I have created a pregnancy-specific product called the Beautiful Belly Bar which is a solid moisturising bar made using local beeswax, organic shea butter, organic rosehip oil and calendula oil. It is naturally nourishing and protective for your pregnancy body and the beautiful and luxurious essential oil of neroli makes it extra special. Simply rub it on, and rub it in. And one of my Beautiful Belly Bars is up for grabs! To be in with a chance of winning, just comment on this post or on the babytalk facebook page and the winner will be notified accordingly. Since 2001, Lisa Heeney started working with pregnant women as a reflexologist and aromatherapist, but is now focussing on developing her range of hand-crafted natural body products. Lisa is an advocate of natural pregnancy and birth and wants women to enjoy their pregnancies and have positive birth experiences. She lives in Drogheda, Co. Louth, is married to John and is mum to three beautiful children, Elizabeth, Ruairi and Jacob. We’re delighted to have WaterWipes at babytalk festival and thrilled to have a fantastic prize of 3 MONTHS worth of WaterWipes to give away! To win simply comment on this post or like and comment on the corresponding post on facebook. Winners will be announced next Wednesday – good luck! When you have a new baby, you may be wondering how to take care of their beautiful fragile skin. Babies have skin that is very thin and sensitive, compared to adult’s skin. Everyone loves the feeling of a baby’s smooth skin, but it can be under-estimated the care that goes in to keeping your baby’s skin this way. Here are five tips to help take care of your newborn’s skin without worrying about injuring the skin. Take caution when handling products that you are using on your newborn’s skin. Be aware of any chemical in baby wipes that may cause irritations to the skin. There are many nasty chemical contained in a number of baby wipes that can cause irritations. Try use a baby wipe that is as natural as possible, with very few chemicals because it is recommended by midwives to use cotton wool and cooled boiled water, the most natural cleaning agent. There is no need to wash your baby every day. Too much washing can dry out a baby’s delicate skin leaving it susceptible to rashes or infections. A quick wash down of the baby’s neck, arms and diaper area with a washcloth is sufficient enough most days – unless your baby is running through muddy puddles every day. When you bath your baby make sure you choose a wash that is fragrance –free and only use small amounts. Stay clear of products that contain ‘Sodium Lauryl Sulfate’ in the ingredients due to the harshness of this detergent for a newborn’s skin. Once bathing time is over, dry your newborn and gently use a fragrance free lotion to moisturise the skin. A newborn’s skin is not fully developed when born, especially the melanin which helps to absorb the sun rays. Therefore this means that a baby’s skin will burn quicker than older children or adults. Keep your newborn out of direct sunlight as much as possible. If out in sunlight keep the baby’s head covered with a hat and arms and legs covered if possible. Babies have more skin surface than adults, so they will absorb a higher degree of chemicals. This can increase reactions and irritations of the skin. Where possible avoid chemical sunscreens so your newborn’s skin cannot absorb any of these nasty chemicals contained it them. The chances are at some stage of your baby’s life you will encounter diaper rashes. The materials that diapers are make from that prevent leaking also prevent air circulating, which creates a damp environment prone to rash development. The cleaner and dryer the skin is then there is a lower chance of irritations occurring. Clean your baby’s skin with cotton wool and cooled boiled water or a baby wipe during every change. To avoid diaper rash occurring allow the skin to completely dry before applying power to minimise the rash. When choosing clothing for your newborn it is important to be careful with your selection. Many materials can be harsh on the sensitive skin of a newborn and can cause irritations. Opt for clothing that is made from a soft material, such as cotton, that will be gentle towards the skin. When washing your baby’s clothing, be careful that you do not use harsh laundry detergents as these may irritate the skin when clothes are worn after a wash. In general it is best to use the purest, most natural products on a newbons skin as these will be less likely to cause any reactions. The purest baby wipe is manufactured by Irish Breeze, a leading producer of cotton products and baby care. 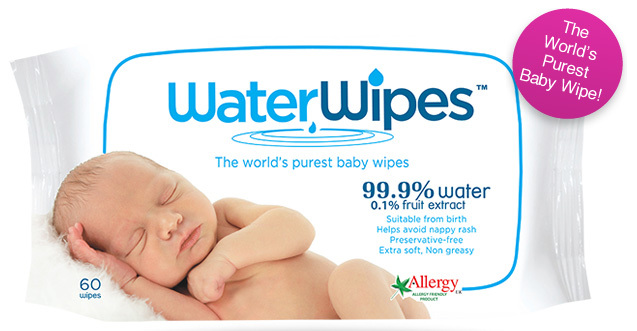 WaterWipes is the first chemical-free baby wipe brought to the market. Free from chemicals and preservatives, WaterWipes are 99.9% water with 0.1% grapefruit seed extract, making them safe for newborns and infants. They are the only baby wipes approved by Allergy UK. This states that the have been tested to prove it is efficient on reducing or removing allergens. For more information on WaterWipes visit www.waterwipes.com. Here at babytalk HQ we’re thrilled to be featured in a double page spread in the new edition of Easy Parenting Magazine! Why not pick up a copy now or click on the image above to read the full article. We’ve really enjoyed working with the Easy Parenting Team and are looking forward to visiting them in the gorgeous Easy Parenting Cafe over the festival. They will have exciting hourly competitions so pop over and say hello to them! 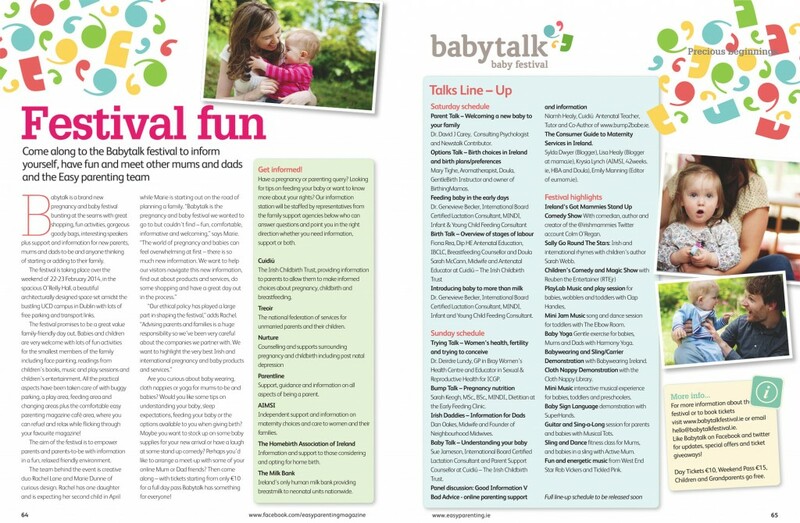 The Easy Parenting team will also be signing Mums and Dads up for their Ultimate Parenting Panel over the Babytalk Festival weekend. The panel will be made up of real life Mums and Dads just like you. Once you sign up – which is very easy to do, you will be asked to take part in focus groups, surveys and the best part – product testing! Sound like fun?! Well to make it even more appealing, they are also offering to pay for your opinions! To find out more or to sign up to join the panel, just pop an email over to editor@easyparenting.ie or text “Ultimate Parenting Panel” with your name to 087 1376574 (normal charges apply), or pop over for a chat when you visit the festival. We’re delighted to have friend of the festival comedian Colm O’Regan performing his hilarious “Ireland’s Got Mammies” show at Babytalk festival! 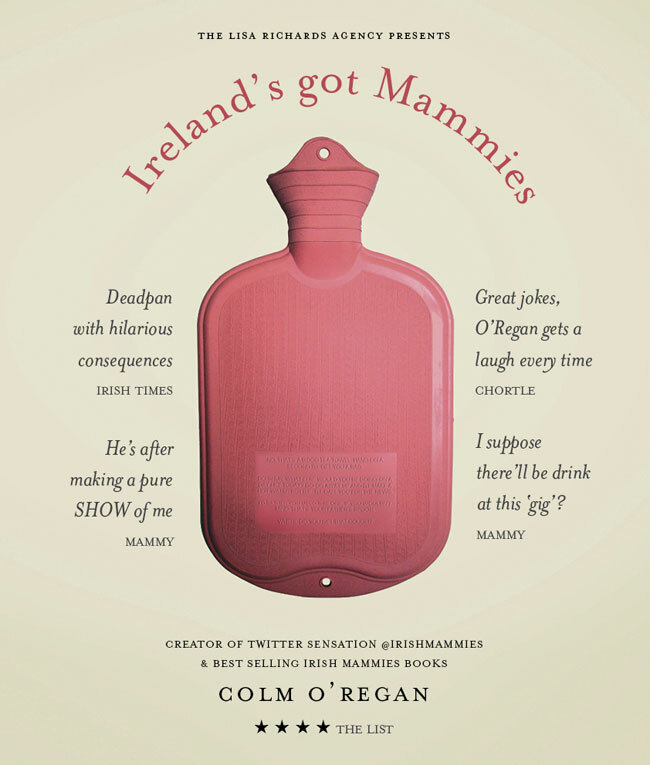 The show is based on the popular @irishmammies twitter account and the best selling “Irish Mammies” books. Exploring topics ranging from teatowel hierarchy to the importance of a Safe Place for things, the show will be taking place in our talks room on Saturday and Sunday at 1pm. Festival tickets include entry to the show so book now!